She was a warm, straightforward, bright and funny woman with an inspiring life story. I had the pleasure of hearing her speak once when she was in Philadelphia, and was also greatly inspired by her book, Unbowed. You can read the NY Times remembrance here. 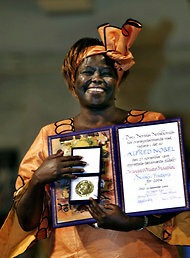 “Wangari Maathai was known to speak truth to power”–I like that quote! Kenyans should plant 100 trees in her honor.